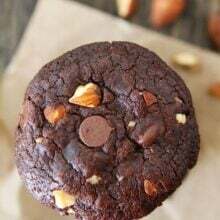 Vegan Chocolate Almond Cookies-rich and fudgy chocolate cookies with chopped almonds and chocolate chips. Most people talk about cravings during pregnancy, but what about cravings after having a baby? I am nursing our little Maxwell and I am starving all of the time! I am craving WAY more foods now than I did when I was pregnant. I am constantly craving something and the number one thing on my list right now is CHOCOLATE! Why can’t I be craving broccoli? 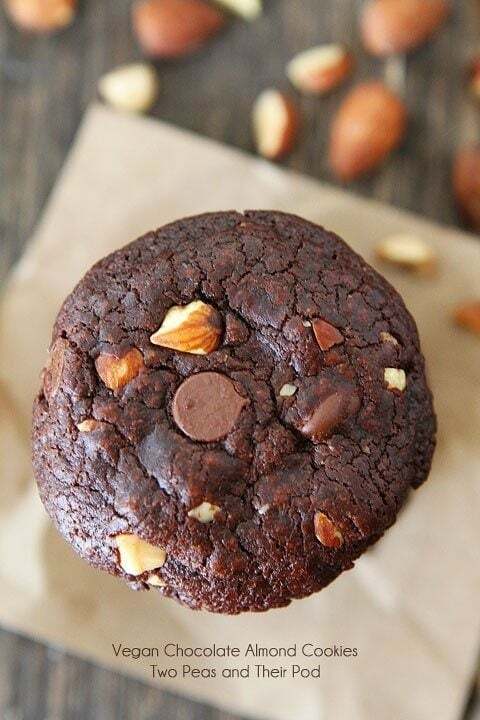 Ok, I crave veggies every day too, but they are always followed up by something sweet…like these Vegan Chocolate Almond Cookies. I made a batch of these cookies before I had Maxwell and instantly fell in love. They are divine! So I made another batch to stick in the freezer for a rainy day…or a tired and starving new mom day:) I am so glad I did because they cure my chocolate craving every time! 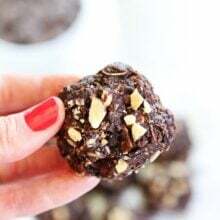 These cookies are so rich and fudgy you will never know they are vegan! They are almost too good to be true! 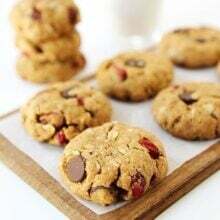 The cookie dough is made with Dutch process cocoa, coconut oil, Almond Breeze Unsweetened Vanilla Almond Milk, chopped almonds, and chocolate chips! 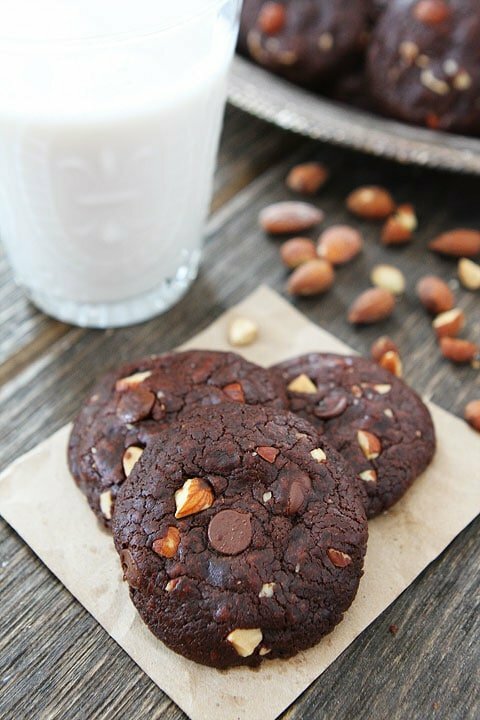 There is a lot of chocolaty goodness going on in these cookies and the almonds add a nice crunch! 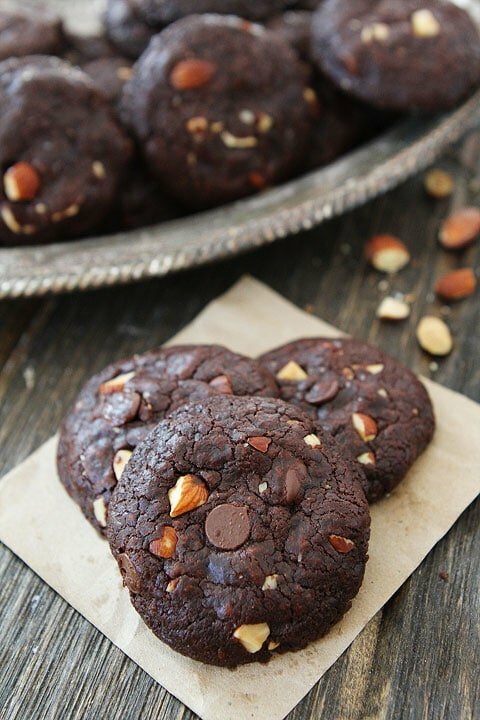 Rich and fudgy chocolate cookies with chopped up almonds and chocolate chips. You will never know these decadent cookies are vegan. They are SO good and they freeze well too! Add the flour mixture in two batches, alternately with the milk, with the mixer on low. Stir in the almonds and chocolate chips. Note-make sure you use vegan chocolate chips if you need the cookies to be vegan. I like Enjoy Life brand. Store cookies in an air-tight container, for up to 3 days.They also freeze well! Disclosure: this post is sponsored by Almond Breeze, but our opinions are our own. I LOVE Almond Breeze, I always have the unsweetened vanilla and original on hand. I thought I knew what I was baking today, but I think my mind may have changed! Pinned! Starving ALL the time!! I swear I eat more nursing than pregnant! When I was nursing I craved all sorts of foods, more so than when I was pregnant… Mostly protein and the occasional sweet. 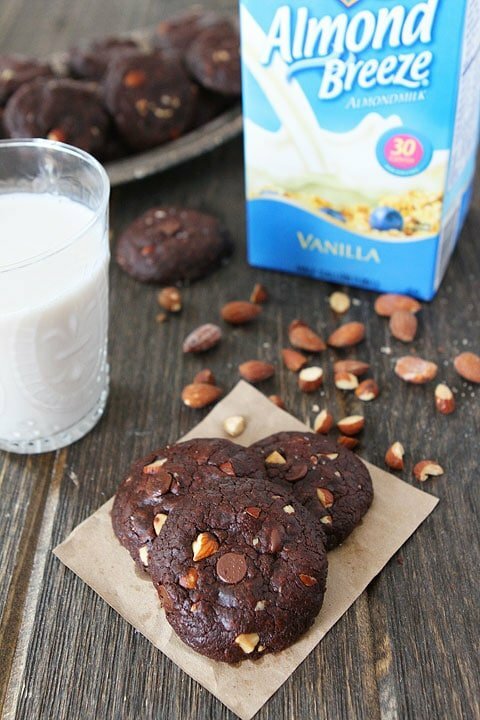 Never broccoli though:) These cookies look perfect and we love Almond Breeze here! It’s the only milk we drink. Thanks for sharing! 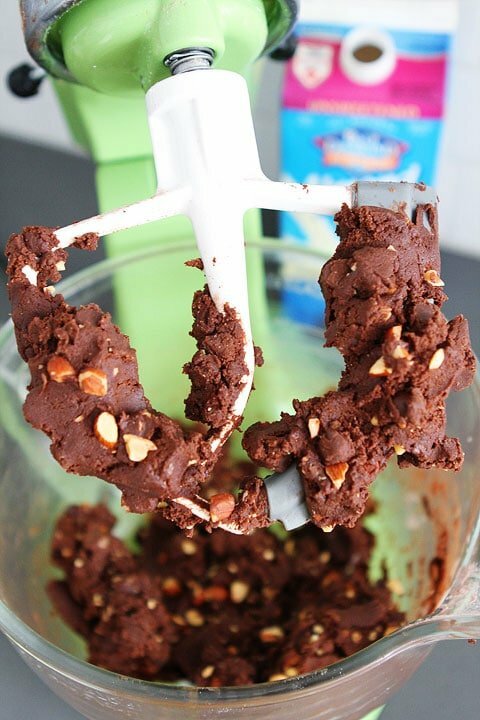 Ah these look delicious and I bet the coconut oil adds a really interesting flavor in the mix! Mmmm….these look so chocolaty and delicious! Pass me a dozen! These look so decadent! Would love a batch! Almond Breeze is the best!! I never use regular milk in my cooking anymore – always almond milk, and I love it! Love the use of almond milk in this. these look great Maria! If I swap out the AP flour I can totally make these for my kids! As always, another incredible cookie recipe! So delicious! I need to make these now! Perhaps you need a magnesium supplement? I started craving chocolate all the time, and that’s what my dr. told me to do. Now, my chocolate situation is under control. I love baking with coconut oil! It’s gives the cookies a nice coconut-y taste, and it’s also a lot healthier! OMG these look delicious! Need to try making these soon! These cookies look great & I love that they are vegan too! The use of coconut oil inspired me, so I replaced 1/2 of the regular flour with coconut flour and the almond milk with coconut milk and part of the dark sugar with coconut sugar and added a handful of grated coconut, and they were GREAT, super-coconuty if you like that flavour, lots of fab reviews already (made last night for friends, brought leftovers in for my staff). I also used pecans because I didn’t have any almonds around, although I think macadamia nuts would work especially well with coconut. I’m going to try it with all coconut flour for my gluten-intolerant friends. 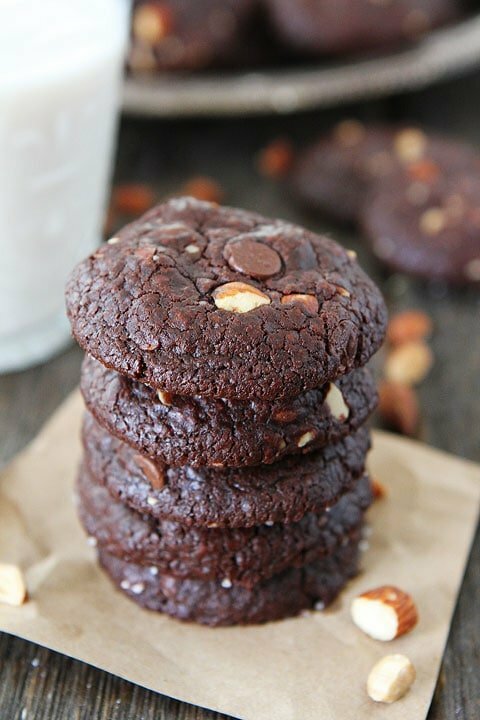 I loooooove almonds and almond milk, so these chocolate beauties are SO happening!!! I would love one (or three) of these with a cup of tea! That dough looks to die for! Would love a gluten-free substitute for the flour – can anyone suggest a combination of flours that would work well? I saw these on your Instagram account and had to jump over and take a look! I’m pregnant and crazy sugar sugar sugar – especially chocolate! I can’t wait to give these a try! Yum! 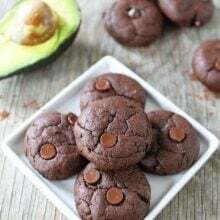 These look so fudgy! I always have almond milk in my fridge and I love recipes that are more naturally vegan; these look fantastic! I love this yummy stuff in which the chocolate chips melt fast while the flavor of almonds lingers on. I suggest you dunk it in milk for best results but make sure you use the Dunkin’ Buddy. It ensures that your cookie doesn’t crumble and you enjoy it the way you love to. I just made these (eating one right now, lol). They are absolutely delicious! Thank you for the recipe! I left out chocolate chips (because I had none). They tasted quite salty fresh out of the oven, but I put them in the freezer and that seems to have diminished. My boyfriend prefers them frozen over fresh, weirdly enough! Can I use a different kind of oil (sunflower?) or is coconut oil necessary for texture? Made these cookies for a Thirty-One party I hosted this weekend and they were a HUGE hit. I used Trader Joe’s chocolate chunks (dangerous move) and it took the chocolate to a new level. They are SOOO good. I will have to try those chocolate chunks! Glad you liked the cookies! I am so glad you liked the cookies! They are one of my favorites! So happy you are enjoying our recipes! Hiya, About how many cookies does this dough make? Also will sunflower or other oils be ok? Thanks! I have a question-What do I do if I don’t have a stand mixer . Ils sont tellement bons!!!!!! Un vrai délice ♥ They are so good!! Pingback: 25 Snow Day Activities - Rock.Paper.Glam. These are absolutely awesome! 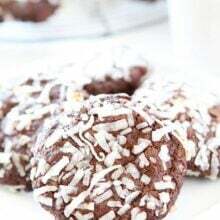 I make them for people with several allergies…use gluten free flour mix and I use shredded coconut instead of almonds for those with nut allergies and then use regular milk with almond flavoring. That makes them egg, dairy, gluten, nut free. It’s SO hard to find good recipes for people with multiple allergies and these are about the best cookies every…regardless of whether or not you have allergies. They’re definitely my new favorite just as the recipe is. Can I give it 10 stars?